We all know Google Maps is a great tool for getting directions to just about anywhere, but with a new update rolling out to Android and iOS users, you’ll also be able to use it to tell someone else where you need to go. Thanks to a tighter integration with Uber, you’re now able to book, pay, and track your Uber rides without having to leave Google Maps. The process is similar to the one that was launched last March. When you type in a destination, tap the taxi-hailing icon to get a list of times and prices from both Uber and Lyft. The difference is that now when you select one of the Uber options you’ll no longer be whisked away to the Uber app. Instead you’ll see a new Request button, which directs you to log into your account and complete the payment process right in Google Maps. Once booked, a tiny car icon will appear on the map to track the progress of your ride. 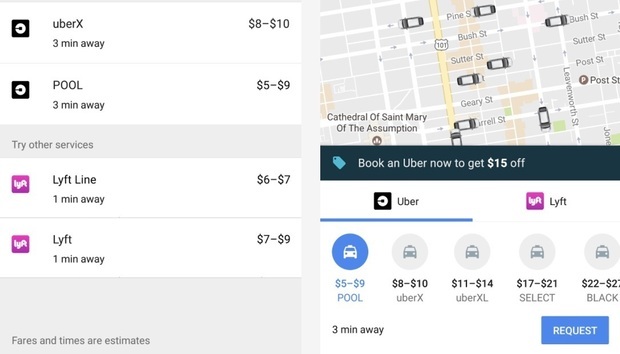 Google has also tweaked the look of the ride-sharing sheet in the update, moving it to the bottom of the page and creating separate tabs for Uber and Lyft. At the moment, the Lyft option still takes you to the companion app, and it’s unclear if the integration will extend to the competing ride-sharing service. The Uber integration requires an update to the app, though the server-side feature might not be immediately available to you. iOS users can look out for the update in the App Store, but Android users who don’t want to wait can side-load the Google-signed APK from APK Mirror. The impact on you at home: Hailing an Uber with the Google Maps app wasn’t difficult before, but one-stop shopping is always preferred. And if you’re leery of Uber tracking your every move in its app, you don’t have to use it anymore.